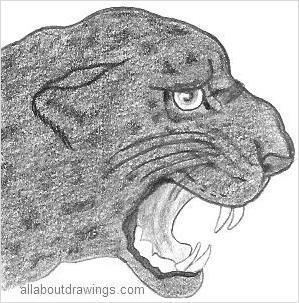 I created these panther drawings with a mechanical 2B pencil on photocopy paper. Easy subjects = good results = encouragement to continue. Your skills are improving while you are enjoying yourself. Any or all of these alterations will result in original artwork by you. There are many various methods of shading that you can implement, it's just a matter of what you feel like experimenting with when you select your next topic and whether it will suit that particular piece. With the panther drawings on display here, I felt that plain shading was required, however, they aren't so dark that you can't see the appropriate details that define a panther. The black panther is really a dark leopard. If you dared get close enough, you would see that it really does have darker spots -- I'm happy to just take the expert's word on that one! The lion and the tiger are bigger than a leopard. The leopard is an expert tree climber. The type of leopard that lives in a forest is a darker leopard than the ones that live on open plains. You are more likely to find a panther in a forest. The puma is referred to as a cougar, a mountain lion and sometimes it is called a panther. To me, the lines seem blurred as to what a panther really is. When an artist gains a bit of experience, they use their knowledge of the cat family to draw any type of cat. That's because the basic profile is similar for all cats like the leopard, puma, cheetah and tiger. Knowing this fact will help you to draw the animal more accurately. All you have to do is add a bit of character that pertains to your particular subject. You lessen your chances of making errors in ignorance if you understand the principals of the cat. I realized when I was doing these panther drawings, that I wasn't putting any emotion into them. I was concentrating so hard on getting the outline right that I didn't think to inject my own personality into it. I have to release that rigid discipline and put in more emotion. I am assuming that will evolve with practice and time. What am I feeling about the black panther? Can I feel his strength emanating from the drawing? Have I portrayed that strength well enough? You may find drawing difficult sometimes, I know I do, but that's nothing compared to the pleasure to be had. Like when you finally get an illustration right, the satisfaction is very rewarding. The art of drawing opens your eyes to the world and you start to see things you have never noticed before. Just keep persevering and you will ultimately succeed at drawing. The greatest secret in learning to draw is to practice as much as you can. You'll derive many benefits if you get into the habit of carrying around a sketchbook and draw every little thing you see. 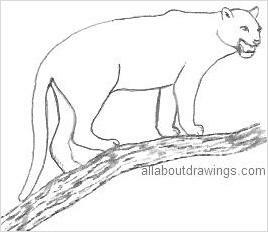 Good luck with your panther drawings. I admit I had quite a few practice sessions before I was satisfied with the ones I am showing you today. As for degree of difficulty, hmmm, animals and humans are subjects that I need to focus on a lot more before I see real improvement. Going by what I read and feedback, it seems they are the typical harder topics to master. If you keep an open mind and show no fear, you can draw whatever you want to. The older I get, the more convinced I am that our minds are very powerful. I wish you all the best in your artistic adventures.